UltraPeptide™ Advanced Deep Regeneration Skin Serum is formulated with 5 super-concentrated key ingredients to attack all the signs of aging. It is clinically proven to drastically improve deep wrinkles as well as fine lines on an instant and long-term basis, allowing you to look years younger. It contains peptides that aim to shrink enlarged pores, with deep penetrating and long-lasting Vitamin C to target age spots, fade discoloration and redness. In short, this is the most complete treatment for the overall signs of aging. Help your skin live longer! The sophisticated nutrient-dense serum penetrates into the deeper layers of the skin for maximum nourishment and renewal which allow skin to remain shine-free yet well-conditioned all day long. Rebuild collapsed collagen structure of skin for smoothing, plumping, firming, and improving elasticity. UltraPeptide™ contains the most potent dose of anti-aging ingredients and the highest concentration of active ingredients that your skin needs in their optimum condition. UltraPeptide™ is super-efficient so you do not need more than just a few drops to illuminate your skin and give it an immediate boost. It comes with a convenient dropper applicators to help you dispense just the few silky drops that you need for every application. 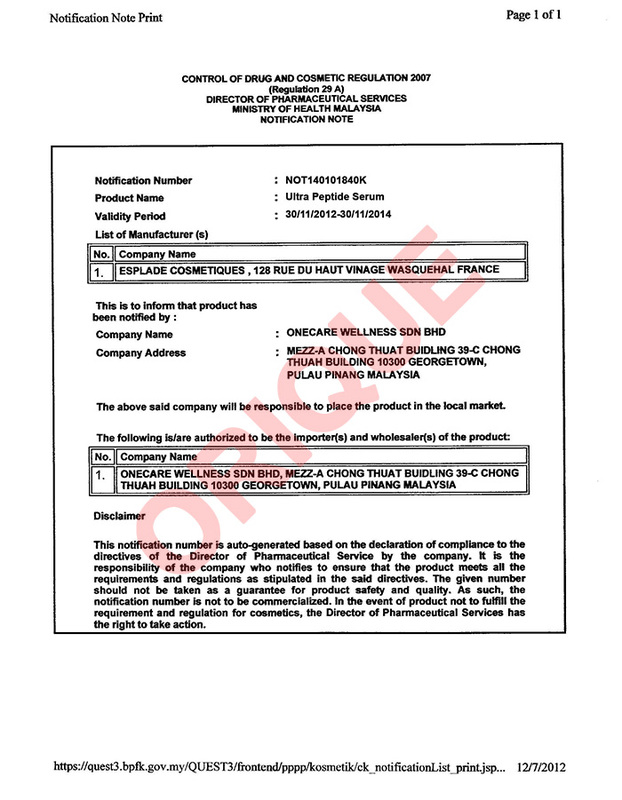 contains very, very expensive ingredients-the best in the market. possible for longer lasting effects. 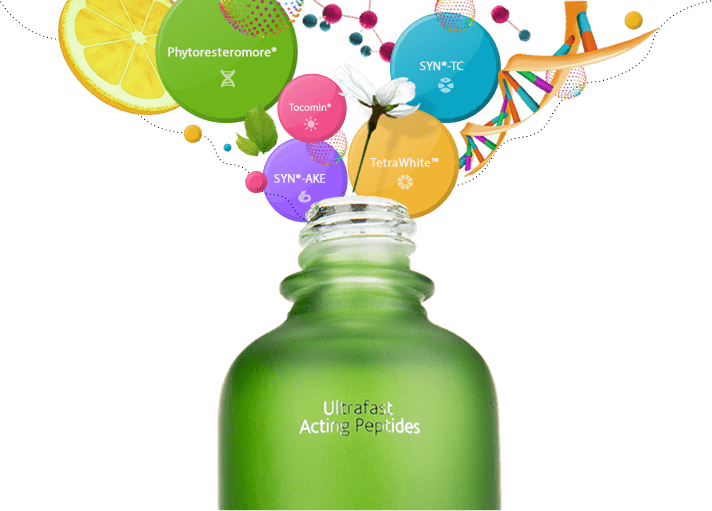 UltraPeptide™ contains a generous amount of the finest premium ingredients, ensuring the best and longer-lasting results within the shortest time. Derma-filler and Surgical Face Treatments! Collagens play a major role in the skin, ensuring proper functionality and thus perfectly smooth, young-looking skin. During the process of ageing our body's natural production of collagen in the skin decreases, and as its functionality is reduced typical signs of ageing become visible. Whilst traditional anti-ageing approaches mostly focus on dermal collagen type I, SYN®-TC follows a more holistic approach that focuses on total collagen care. A particular focus is set on collagen type III - the so-called youth collagen - that is known for its skin smoothing properties, especially in young skin. 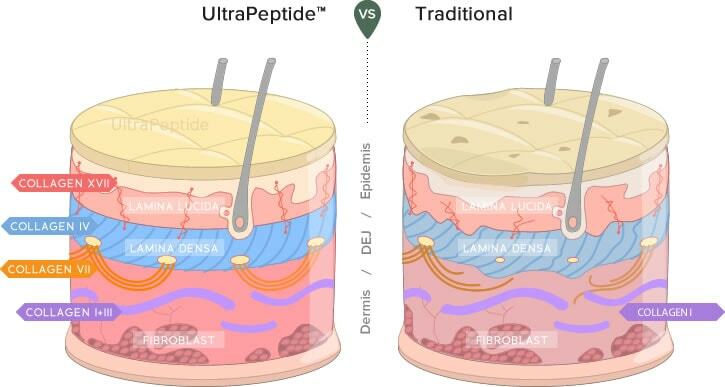 Additional focus is set on the collagens of the dermal-epidermal junction (DEJ), especially on collagen IV, VII and XVI, the so-called anchoring collagens that are essential for skin functionality and support skin firmness. SYN®-AKE is an effective wrinkle smoothing compound, Based on a synthetic tripeptide that mimics the effect of Waglerin 1, a peptide found in the venom of the Temple Viper, Tropidolaemus wagleri. SYN®-AKE helps to smoothen the appearance of expression lines. A unique approach for the breeding and housing of venomous snakes whose venom is used for therapeutic (anti- coagulants, haemostatics) and diagnostic products. The long experience of DSM with Pentapharm in snake venom research made the investigation of venom peptides for cosmetic applications possible.The Temple Viper's hunting method makes use of the venom protein Waglerin 1, which has a strong muscle- relaxing effect. The tripeptide SYN®-AKE mimics the essential amino acid sequence of this functionality. SYN®-AKE's activity is attenuated compared to Waglerin 1 and has been thoroughly tested. It is a safe, effective, and painless cosmetic alternative to controversially discussed muscle-relaxing anti-aging treatments like botulinum toxin. Test period: 16 weeks. Concentration: 10%. Result: complete removal of pigmentation (age spot). Normal water-soluble vitamin C does not have VC-IP's benefits because normal vitamin C can't penetrate the lipid layer of our skin. VC-IP can successfully penetrate the skin and provide maximum benefits to the layer underneath. Tetrahexyldecyl ascorbate also offers additional anti-aging benefits by stimulating the production of glycosaminoglycans, compounds naturally present in skin that binds to water. Levels of glycosaminoglycans decline with age and may account for some of the skin changes that occur as skin matures. I have been applying Ultrapeptide for 2 months now and loving how it fades off my pigmentations and dark spots. As my age increase, I start to notice dark spots and pigmentations forming on my skin. Initially I intended to go for a laser treatment, but due to budget restraint, I’ve decided to look for an alternative and found Ultrapeptide. Though the price of this serum is slightly above average, but compared to laser treatment, this is way more affordable and since it was said to be effective, I gave it a go anyway and did not regret my decision! I have been applying Ultrapeptide for 2 months now and loving how it fades off my pigmentations and dark spots. On top of that, my skin became brighter, more radiant, firmer and smoother which is an additional benefit for me! This is an amazing serum and I highly recommend this to those who are concern about pigments, dark spots, dull and aging skin! My skin is insanely good as a result of using this every day and night! This product really works! I'm always very critical of products that claim to restore elasticity and repair skin. I took this photo after 10 day of application and even I am amazed by the results. I experienced similar results on my face and neck, My skin is insanely good as a result of using this every day and night. I hated using fake expensive, falsely advertised product because it always made my skin peel and red, however this stuff is truly effective without the irritation. People are in awe of my skin. This is an excellent, excellent product. A new permanent addition to my daily regimen. I love these three products and how they work together perfectly to make my skin smooth and plump. I love my new skincare routine. Every morning I will apply UltraPeptide serum on my bare skin And I wait for it to absorb for 5 till 10 minutes. It has 100% natural active ingredients and I’m truly obsessed with this product, it’s really one of the best serum I have ever tried. It helps minimize my pores and makes my skin more glowy. After that I use UltraMoist which is great for me because I have dry skin. It keeps my skin looking perfect and well-hydrated all day long. Lastly I would apply UltraShield to reduce and cover skin imperfections. It leaves my skin smooth and even-toned. I love this cream because it comes out in a tint so it just really evens out my skin and makes my skin look beautiful. 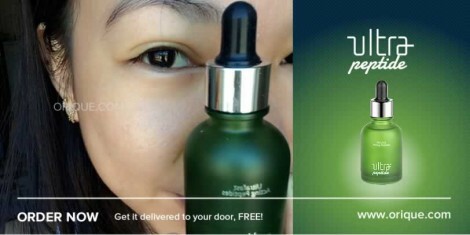 It also protect my skin from harmful UV rays and infrared rays, and its perfect under makeup. I love these three products and how they work together perfectly to make my skin smooth and plump. I've only had this for 4 days, but I love the moisture and the way it makes my skin feel. I use it twice daily, before bed and after my shower for work. You don't need much. It spreads and coats. I have not had any breakouts with it and I have oily skin and am prone to breakouts. I have noticed a positive difference in my skin's texture and color. I even cancelled an appointment for Botox and filler, since I was so pleased with the results from using Ultrapeptide. All-in-all, I love this stuff. My skin feels radiant and plump, which i loved so much! I already finish using the Minus Minus Mini-Kit 3 and Ultra Peptide. 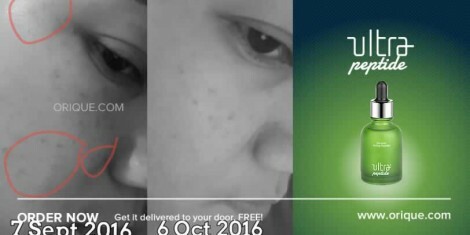 As a result, my face became smoother, supple and blemish free. I’m looking forward to purchase these Orique products again. Thank you Orique ! My face looks fresh, fair, supple, smooth, & the oil is much reduced. This product really works! Been using Orique ultra peptide serum for morning and night for 1 month, and the result is quite obvious, my picture before is wearing foundation and powder, but my face looked very oily and the pores were large, after 1 month using Orique , picture no 2, is my face not wearing anything, i just finished washing my face, it looks fresh, fair, supple, smooth, also the oil much reduced, i think this product really works. I have a serious hyperpigmentation problem on my face. After a month, some of the pigmentation disappeared! I have a serious hyperpigmentation problem on my face since 2 years ago. I have tried many types of serum from well-known cosmetic companies, unfortunately none of them actually work. After i saw Orique ’s advertisement on FB, I bought UltraPeptide and started using it on 7 September 2016. After a month, some of the pigmentation disappear. This photo has never been edited. I purposely captured the photo on the first day i applied the serum just to see how effective is Orique UltraPeptide and compare it with other brand . Hope you can see the difference as well. After my first application, my skin looked brighter, cleaner & smoother. My face looked glowy & soft as the enlarged pores had shrunk a lot. Before this, I have huge and enlarged pores especially on the nose area. While surfing Ag-Factor’s Facebook I stumbled upon another product which claims to help improve skin texture which was the UltraPeptide . Thus, I proceed to purchase. After my first application, the difference is there whereby my skin looked brighter, cleaner and smoother. My face looked glowy, soft as the enlarged pores had shrunk alot. I will continue to order UltraPeptide again together with Ag-Factor for a complete inside and out treatment. 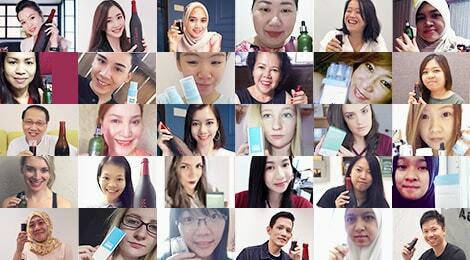 UltraPeptide is one of the most effective all-in-one serum that I have ever tried. I now depend on UltraPeptide to keep me looking young! Before I found UltraPeptide , I had been using several serums, which are of highly recognized brands and honestly I can say that UltraPeptide is one of the most effective all in one serums that I have ever tried. 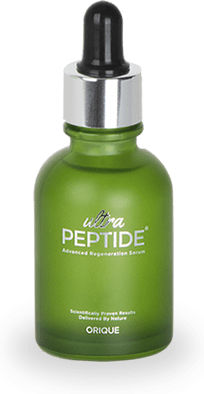 UltraPeptide is a product regime that I can’t miss everyday and it has significantly reduced the fine lines on my face and improves the firmness of my skin. I am now depending on UltraPeptide to keep me look young. Therefore, I definitely recommend UltraPeptide to anyone who is concern on having a younger-looking skin face and a fresher appearance. So effective, really love Ultra Peptide. 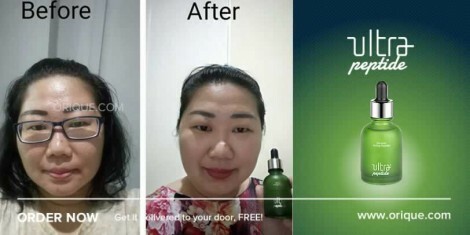 So effective, really love ultra peptide in just 1 month of using it, so happy with the result.